This week, animal cruelty and trophy hunting took centre stage when a man from Minnesota killed a popular lion named Cecil, in Zimbabwe. By now you know Cecil was lured from his protected home and shot with a bow and arrow, then later beheaded and skinned for his hide. This lion was one of hundreds of endangered species killed for sport in sub-Saharan Africa each year, and his beloved status among tourists and researchers set off a social media firestorm. Putting aside the tragedy of this majestic animal’s loss, one other thing struck us about the media coverage on Cecil and the now infamous Walter Palmer. Dr. Palmer was, and remains a practicing dentist. The career of this trophy hunter was reported in every single article on Cecil we could find, and is mentioned in every piece of video coverage we saw. A search on Google for ‘Dentist’ or ‘Dentist News’ returns article after article on the hunter and his now closed dental practice. Palmer has gone into hiding after releasing a brief statement. He and his family received death threats, his practice was inundated with bad reviews and an extradition attempt is now underway. We certainly don’t condone trophy hunting, legal or otherwise, and hope this media coverage leads to a discussion about endangered animals, and animal rights in general. Yet, the flurry of articles about Cecil and Palmer got us to thinking about how dentists are portrayed in the media. Several of our dental offices have expressed a desire to make statements condemning Palmer’s actions, as if as dentists, they needed to go on the defensive. This is a natural reaction for those of us in the dental profession. After all, from a sound bite perspective, Palmer the dentist has become as much a part of the headline as Palmer the lion hunter. Dealing with negative media coverage is nothing new to dental professionals. Search for ‘dentist’ in the news and you’ll be hit with stories about how rich dentists are, how a dentist in the US was arrested for mistreating patients or how dentists are more likely to commit suicide than people in other professions. It is rare to see a positive story about dentists making breakthroughs or helping patients improve their quality of life. The picture the media paints is not a complete one. Dentists are medical professionals – caregivers who dedicate their lives to helping others. The negativity some people feel towards dentists and dentistry is largely misplaced, and media has done little to help change those misconceptions. Consider that many dentists in movies or television are portrayed as inept, mean spirited or even cruel. Consider that the dentist’s office is still considered a scary place to many children, who learn at an early age to fear needles and drills – even though such things are used less and less in a modern practice. In fact, visiting the dentist today is often times a painless experience – and a positive one, when you take care of your teeth. The stigma goes back decades, to another time, when dentistry was still struggling to come into a modern age. Screeching drills, uncaring grumpy doctors and a tendency to wait for something to break before bothering to fix it made for a pretty gruesome experience in the chair. Over generations we passed that experience on to our children, and because oral health is not covered by government insurance, the dollar cost of going to the dentist has continued to send the wrong message to many people. Consider that dentistry is by far the most affordable aspect of health care when compared to the true cost of many medical treatments. And, now more than ever before we know that dentistry is closely linked to overall health. Dentists themselves go to school for years just like other doctors, and are regulated just as firmly. Dentists do make a good income, but like many doctors and lawyers, it’s a misconception that most dentists are rich. Many of us spend years paying back loans, just like other professionals, and unlike doctors in a hospital, dentists pay for the equipment we use, sometimes to the tune of hundreds of thousands of dollars. We’re not saying you should feel bad for dentists or others working in the dental profession. We chose careers in the field because we love it. We want to see our patients smile and we love to make a difference in their lives. And just like you, we want to raise our families in healthy, vibrant communities. Greenline Dental Centre in Coquitlam Centre mall supports cultural events at Evergreen Cultural Centre and Coquitlam General & Sedation Dentistry donated over $120,000 in dental services to mothers for smile makeovers. This August ValleyFair Dental and Maple Place Dental in Maple Ridge will take part in The Ride To Conquer Cancer and Coppersmith Dental in Richmond just finished Mudderella for charity. 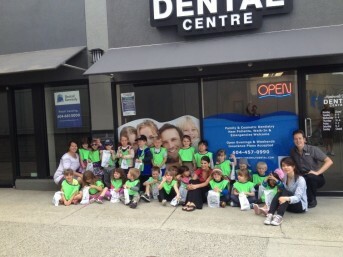 Wesbrook Village Dental supports Mom & Tot Play Groups to help young children become more comfortable with dentistry and Meadowtown Dental in Pitt Meadows supported the Rhett Syndrome Walk. Nearby Meadowvale Family Dental entertains children from local schools to put them at ease about dentistry and Willow Dental Abbotsford was just awarded the URoc Award for supporting troubled youth. 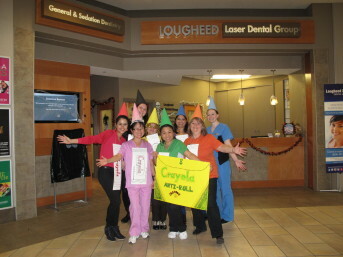 And Willowbrook Dental competed in Colour Me Rad in support of LAPS, the Langley Animal Protection Society. That’s just to name a few clinics in our network doing good in their community. The entire 123 Dentist network has supported the BC Cancer Foundation with free VELscope Cancer screenings and donations. We support dental education at UBC, various sports teams in the lower mainland and stood up against bullying with Pink Shirt Day. Recently we launched a FREE 24/7 Dental hotline and opened Stayte Dental, a new low-income dental clinic where dentists volunteer to offer more affordable care. 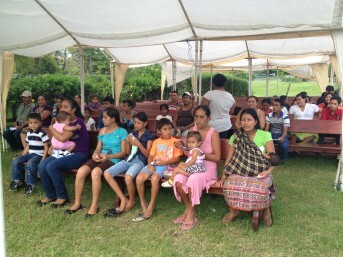 Abroad, many of our clinics are equally active. Granville Station Dental has been sponsoring a child in India; Willoughby Town Centre Dental provided relief in Haiti and Harbour Centre Dental took a team of dental professionals to open a clinic for locals in Guatemala. South Point Dental even supported a new home for a family in need through the Cambodian Children’s Fund. 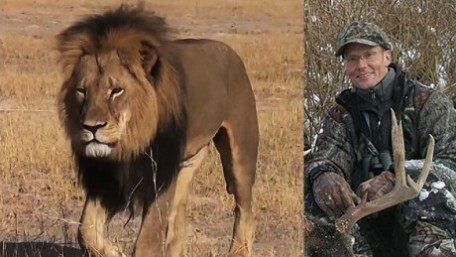 Which brings us back to where this all started, with Dr. Palmer and Cecil the Lion. Media coverage in the digital age is often troubling, regardless of what your profession is. For us, this terrible series of events put dentists in an unfavourable spotlight yet again, and we wanted to take the time to address that. Our hope is that when you consider visiting the dentist, your first thought is for the daughter who got braces so she can have straight teeth in high school, or for the grandparent who received new implants and a brand new youthful smile. Don’t think of Dr. Palmer, who took something away from the world, think about all of the dentists and clinics that are giving back. Together, we can bring light to what’s really important, because we’re a giving organization of dentists who love to make a difference in the community around us. If you’d like to learn more about issues of trophy hunting and animal rights, we encourage you to consider becoming involved in one of these worthy organizations.